It’s never too early to start with those new years resolutions, and if you’re in the health and fitness industry you’ll be helping people achieve those resolutions soon enough. 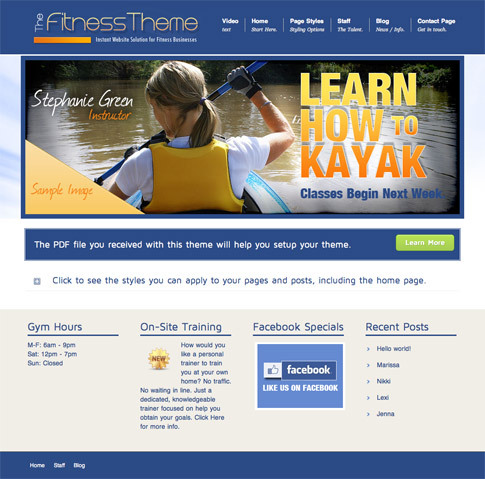 Fitness WordPress Theme from Aloha Themes comes with a great homepage image slider to showcase your gym or fitness complex and is incredibly easy to use. Save thousands on your design costs by going with the pros at Aloha and check out the live demo at the end of this post while you’re at it! Theme options are extremely easy to alter and setting up your site is a breeze with the Aloha Admin Panel. The Aloha Admin Panel gives you full control over every element of your site you could ever wish to change. Come back and check out the showcase as we find more sites from around the web using Fitness. Includes a 3 day money-back guarantee, no questions asked — absolutely zero risk!